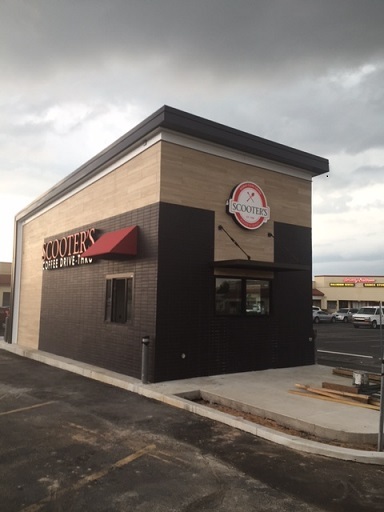 TULSA, OK / ACCESSWIRE / August 16, 2016 / Scooter's Coffee, the Midwest-based coffee franchise that has experienced tremendous growth over the past year, will increase their presence with the company's latest Grand Opening in Tulsa, OK (6954 S Lewis Ave) on Friday, August 19. To celebrate the opening, the new location will offer $1 medium drinks all day. "As we expand nationwide, the state of Oklahoma is a natural fit for Scooter's," said Rob Streett, Scooter's President & COO. "The growing market is primed and ready for a coffee shop that delivers world-class products with a welcoming smile." On August 19, Grand Opening Day, customers can also expect to receive several fun giveaways; beginning at 9am, the first 100 customers will receive a t-shirt or coffee mug. For the afternoon crowd, there will be $5 gift cards given away for the first 100 customers beginning at 2pm. Morgan Wolff and William Allen will own this location. "We got involved with Scooter's because we wanted to have a place where people could conveniently get an amazing cup of coffee or a delicious fruit smoothie," said Wolff. "As local owners, it gives us an opportunity to brighten their day and make a positive impact in our community. When we met the founders of Scooter's, Don & Linda Eckles, we knew immediately that this company was a fit for us"
With more than 140 stores open in 12 states, Scooter's Coffee has signed agreements in four additional states throughout the country and will open over 40 locations from coast to coast in 2016. Over the next few months, the company boasts a robust grand opening pipeline, which includes its first-ever location in the state of Arizona. Earlier in the summer, the company opened its first of many locations in Florida. It will also add several locations to expanding markets, such as Iowa, Kansas, Texas and Georgia this year. In 2016, the company has also added to depth to its product profile, releasing a new line of Organic Hot & Iced Teas earlier this summer. Currently, Scooter's is touting its new Cold Brew & Cream offering, which combines slow-steeped cold brew with 100% real cream and several innovative flavor options. The company will soon add gluten-free products to its extensive menu. Scooter's, which is based out of Omaha, NE, hand-crafts its pastries and roasts its own 100% shade-grown coffee (sourced through Arbor Day Foundation). Founded in 1998 by Don and Linda Eckles in Bellevue, Nebraska, Scooter's Coffee roasts only the finest coffee beans in the world at its headquarters in Omaha, Nebraska. Scooter's success over 18 years of history is simple: stay committed to the original business principles and company core values. The Scooter's mantra, often recited to franchisees, customers and employees is: "Amazing People, Amazing Drinks...Amazingly Fast! "TM It represents the company's business origins from 1998 and reflects a steady commitment to providing an unforgettable experience to loyal customers.